The future of charging is through wireless charging. Wireless charging is different from the conventional way of charging phones, tabs and gadgets. It is not using any cable or wires between the charger and the device to be charged. It seems complicated but here we are going to hack how it works and how wireless charger design principle differ with the conventional chargers. 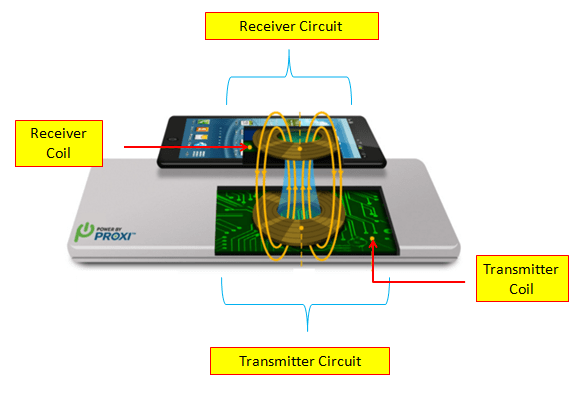 Wireless charger design principle is centered in the inductive coupling. In inductive coupling, the change in the current in one wire will have an induced voltage on the ends of the other wire. The amount of inductive coupling is measured in terms of the mutual inductance. The strength of the coupling will increase when the wires are wind very close to each other. This is not different to a transformer action. 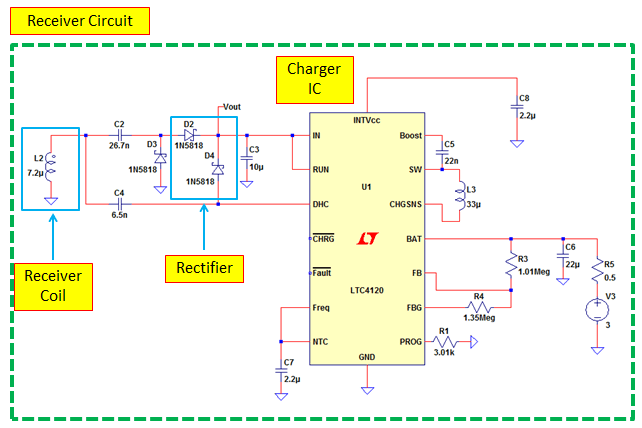 A conventional AC-DC phone charger uses a flyback converter to convert AC voltage to a lower level DC voltage which is usually 5 volts. The main part of the flyback converter is the flyback transformer. Flyback transformer also works on the principle of inductive coupling. The stored energy in the primary winding will be transferred to the secondary winding. Then the voltage on the secondary winding will be rectified and filtered to attain the desired level. Wireless charging is actually operates in the same principle. There is a primary winding which is the transmitter coil in the figure above. There is also a secondary winding that is the receiver coil in the receiver circuit. The only big difference between the conventional charging or wired charging and wireless charging is that in conventional charging there is a physical transformer while in wireless charging there is no physical transformer. In wireless charging, the transmitter circuit contains the primary side of the virtual transformer while the receiver circuit has the secondary side of the virtual transformer. Putting the transmitter and the receiver circuit close to each other will create a transformer action. In a typical wireless charging, the pad contains the transmitter circuit while the cell phone has the receiver circuit. Above is a simple block diagram to explain briefly what the circuits present in a wireless charger are. As mentioned earlier, wireless charger principle is based on the inductive coupling. So, the transmitter should have the primary coil. The transmitter circuit gets its power from the wall voltage. It has a rectifier section to convert AC to pulsating DC. It has also a filter network to increase the RMS level of the rectified voltage. Then it must have a switching circuit to continuously provide changing current to the coil. For better coupling, resonant circuit is being utilized in the transmitter side. In resonance, the transmitted current is sinusoid thus there is only minimal losses. 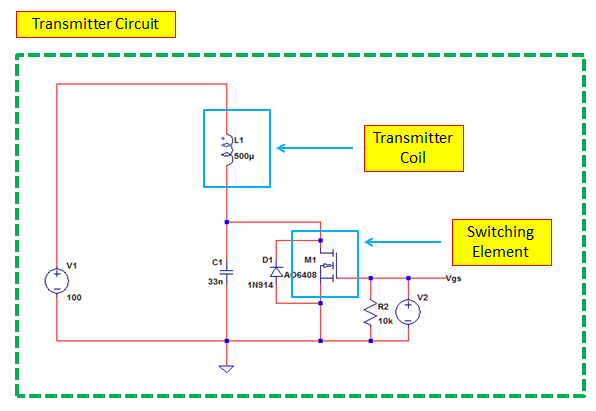 Below is simple transmitter circuit. The voltage V1 is already in DC form. If this transmitter be powered by AC line, then V1 is the output of the rectifier and filter sections. L1 is the transmitter coil. M1 is the switching element so that there is an AC current to the transmitter coil. L1 and C1 form a resonant network resulting to a sinusoid current to the transmitter inductor. When the above transmitter circuit is paired with a receiver and then run the simulation, below is the transmitter coil current waveform. The current is sinusoid which a good indication of a resonance operation. What Happens when the Transmitter not in the Resonance? When the transmitter is not in the resonance, there will be two consequences. First is huge losses in the transmitter switching network. 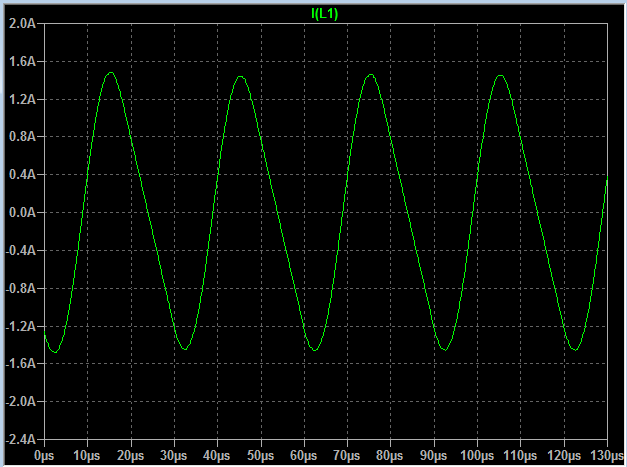 When not in the resonance, the current has high peak which results to a high RMS losses. Second, the coupling of power is may not that efficient. The receiver will catch the transmitted power by the transmitter. The receiver consists of a receiver coil, resonance network, and rectifier and charger IC. In the receiver side, resonance operation is also important. 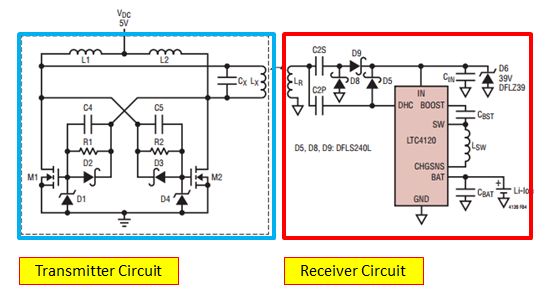 Below is an example of a receiver circuit. It uses LTC 4120 as the main controlling device. L2 and C2 will form a series resonator while C4 will form a parallel resonance once the IC pin turns low. 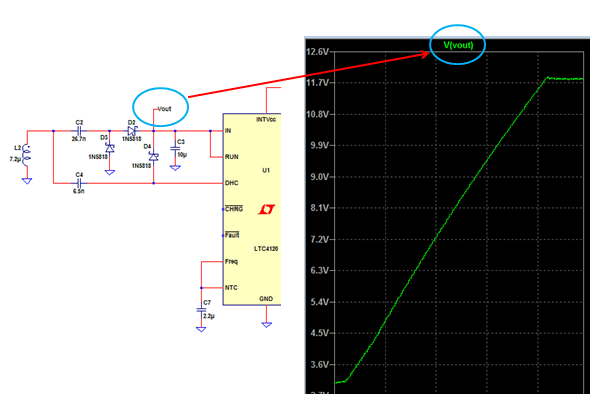 When the above receiver is paired with the transmitter circuit discussed above, below is the DC voltage to the Vout net that is input to the LTC4120. Above circuit shows a wireless charger design sample. In this design technique, the transmitter does not need an external signal to resonate. M1 and M2 are driven automatically by the resonance action of Lx and Cx. There are some design samples for a transmitter, you may use it. A transmitter must have a supply voltage. You can derive this supply voltage from the AC mains using a rectifier and filter to make it DC. The transmitter circuit must have a switching element so that there is AC current flow to the transmitter inductor. For good power transfer, the transmitter must operate in resonance. Examples of transmitter circuits were shown above. Transmitter coil selection includes the size of the inductance, number of turns and the amount of current that will pass to the coil. The resonant network is can be tuned by using the transmitter coil and a selected capacitance. Lx and Cx in the above transmitter is the resonant network of the transmitter. There are some design samples to follow for the receiver, so you can make use of that. A receiver must have a coil to receive the current from the transmitter, it must have a rectifier to convert AC to DC and it must have a control element or IC. The receiver coil selection is dictated by the number of turn of the transmitter coil, level of voltage that need to attain in the receiver and the amount of current that will pass to the receiver coil. Select all parts such that their ratings are not exceeded. Consider current, voltage and power ratings. You need to compute the circuit values for these parameters and use the parts that rating is higher than the computed value. How to pass QI certification one time?